Richard Durand and Pedro Del Mar present their brand new collaboration, ‘Paint The Sky’, on Black Hole Recordings’ Magik Muzik imprint. Featuring the lovely vocals of Roberta Harrison, the track shows the outcome when two talented producers in electronic dance music come together. In the process of preparing Richard's Australia themed 10th instalment of his ‘In Search Of Sunrise’ compilation series, in which Pedro Del Mar was involved with four tracks, the two decided to collaborate on a song. 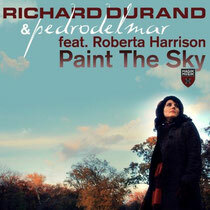 During the recording sessions of ‘Paint The Sky’, the two producers already knew they wanted the voice of Roberta Harrison, known from the indie band Wild Strawberries, to feature on the final version. The track evolves like an emotional journey full of energy but with deeper progressive details. Roberta’s vocals bring back memories of classics like Tiësto's ‘Just Be’ and with remixes by artists like Alex O'Rion, Tom Cloud and Eximinds, this could be a biggie over the festive period. Check it out below, it’s out now.